We’re often critical at the poor level of creativity used in recruitment advertising. A good recruitment advert says a lot about the company, it helps to position it in the minds of prospective employees… and helps to get the right sort of people to apply. 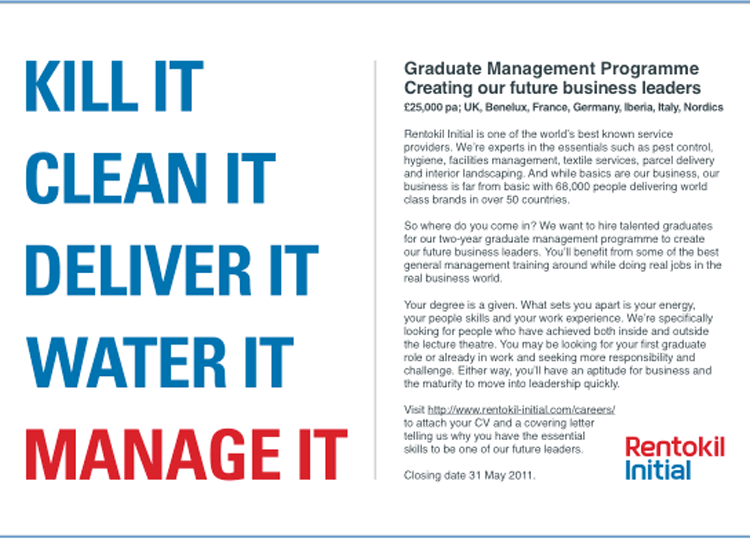 We put these ads together to support recruitment for the Rentokil Initial Graduate Recruitment programme. Group companies deliver a wide range of services, and new graduates needed to be prepared to “get their hands dirty” so we used a bold approach. Equally, we suggested leveraging the power of the existing workforce as part of the recruitment drive, so we developed a special ad for use internally. A full service marketing agency serving B2B, B2C and Not for Profit clients across London, Beds, Bucks, Herts and Essex.